Investors might be worrying about Philip Morris International's high dividend, but the company's fundamentals continue to support its generous shareholder payout. When a stock price declines, it's often a sign of a company in financial trouble. As the stock price goes down, the dividend yield goes up. Quite often, a particularly high yield leads investors to worry that trouble is coming and that a dividend cut might be in the offing. Recently, Philip Morris International (NYSE:PM) stock fell below $80 per share, which meant its dividend yield eclipsed 5%. 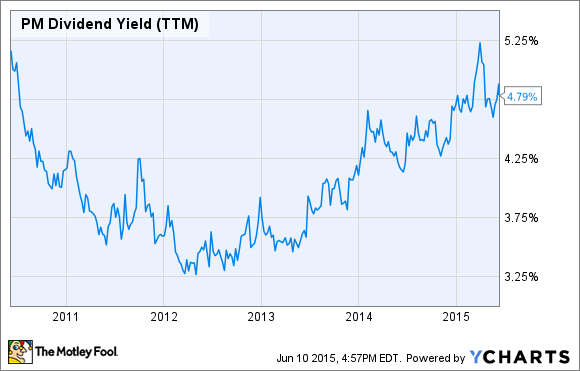 That yield could raise fears about looming trouble for the company's dividend. As you can see, the tobacco giant's dividend yield is very close to a five-year high. PM Dividend Yield (TTM) data by YCharts. But these fears would be misguided. Here's why I believe Philip Morris International's dividend is in no danger whatsoever. While a 5% yield might look dangerous, it's important to remember context. Within the tobacco industry, 5% yields are not a rarity. In fact, most tobacco companies have yielded 5% or more over many years. When Philip Morris was spun off in 2009, it yielded more than 5%. Also, the company that spun off Philip Morris, Altria Group, was a 5% yielder as recently as early 2014. Only recently have tobacco stocks' dividend yields fallen below 5%, as their stock prices have rallied significantly. Yield alone doesn't tell the whole story. More important is a company's fundamentals. On that front, Philip Morris' dividend looks sustainable. In the first quarter, its cigarette shipment volume grew by 1.4% year over year. Revenue and earnings per share declined 4% and 1%, respectively, but much of this was due to unfavorable currency fluctuations. The strengthening of the U.S. dollar over most other currencies is a major headwind for companies that do business in international markets, and that certainly includes Philip Morris. In fact, excluding foreign exchange effects, revenue and EPS would have increased by 9% and 24%, respectively. Philip Morris' fundamentals support its high dividend. The company generated $6.5 billion of free cash flow last year while paying out $6 billion in dividends. Management stated during last quarter's conference call that 2015 free cash flow is expected to be roughly in-line with last year's free cash flow. Meanwhile, Philip Morris expects $4.32 per share to $4.42 per share in profit this year. This can easily cover its $4 per share dividend. Philip Morris has some significant cost-saving measures set for this year to further protect its dividend. It's clear that management is ready to do everything necessary to keep the dividend intact. First, the company won't buy back stock this year. This will result in significant savings, as it spent $3.8 billion on share repurchases in 2014 and $5.9 billion on buybacks the year before. In addition, the company has strict cost controls. Last year alone, it reduced its cost structure by $300 million, with further productivity measures in place this year. These include enhancing production processes, harmonizing tobacco blends, and supply chain improvements. The bottom line is that Philip Morris management understands how seriously investors take their tobacco stock dividends. This year hasn't gone well so far, due to the difficult foreign exchange environment. But Philip Morris is growing its underlying business and taking market share from competitors. Core organic demand continues to rise, which is evident from the company's increasing volumes. This is a good indicator that the underlying business remains strong, which should keep Philip Morris International's dividend intact.